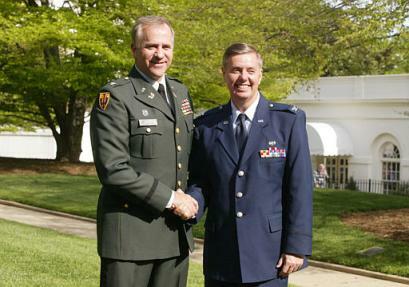 Col. Lindsey Graham has served in the Air Force for a total of 26 years. He spent six years in the active duty Air Force, six years in the South Carolina Air National Guard and the United States Air Force Reserve for the last 14 years. He can retire in 4 years. Col. (Congressman) Steve Buyer volunteered to deploy to Iraq in March 2003 after the commencement of the conflict. He cited the importance of having a lawyer on sote but was turned down by Army officials because if his "high profile." Source: First Thing We Do--Keep Out the Lawyers. Then Isolate the Soldiers. 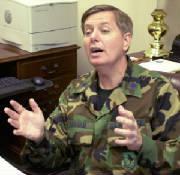 Col. (Senator) Lindsey Graham has been to Iraq twice as a part of Congressional delegations. Graham pulls legal duty at Charleston AFB after being called up in April 1993. U.S. Sen. Lindsey Graham, the only U.S. senator in the Reserves, donned combat fatigues and spent Thursday working in the legal office at Charleston Air Force Base. "I've got to do some Reserve duty, and I asked 'Where can I help?' " said the South Carolina Republican, a lieutenant colonel in the Air Force Reserve. 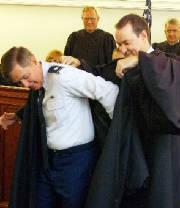 Newly sworn Judge Lt. Col. Lindsey Olin Graham (USAFR) dons black judicial robe for the first time.